Happy Thanksgiving, to all of you who practice it! This won’t be a particularly “big” Thanksgiving for our family, just my husband and me enjoying time with our son, but I’m grateful nonetheless for the opportunity to do so. Even if you don’t live in the States, I hope all of you Cozy Mystery readers can take a bit of time today to think about some of the things in their lives that they’re most thankful for! Happy Thanksgiving to My Favorite Book Blog ! Thank You for taking time to do this ! Esmerelda, thank you >>> I’m certainly glad you found us here! And a VERY happy Thanksgiving to you, as well! Even smaller here…just me and Hekitty, the cat. But we have much to be thankful for, and I’ve already spoken with BOTH of my sons via Skype, since they don’t have enough time off to travel over the holidays. I eat late, so I won’t start cooking for a couple of hours yet, but everything is ready to pop in the oven! Pie was made yesterday. I’m SET! Happy Thanksgiving Danna and all the Cozy Mystery groupies. Dear hubby and I just flew in to AZ for the holiday weekend. We have dinner reservations for just the two of us this time. Next year we will be living here permanently and will probably host the whole tribe because we will finally have a big enough house. Get to visit with some of my favorite family members on Saturday and Sunday and I am very thankful for that and for being near to moving back. Thank you for all the time you put into this site. I love that I have found so many new books to love, and people with similar interests. Bless you and yours! Kivara, you’re welcome, and I hope you’re enjoying your Thanksgiving festivities with both extended and smaller families! Today seems a most appropriate day to let you know how much I appreciate all the hard work you put into keeping the Cozy-Mystery site the place we all depend on. Thank you. Small gatherings can be the very best, hope you have a great day. Tee, you’re welcome, and I hope you had a good Thanksgiving as well! Danna, Happy Thanksgiving! Just think of it has having pardoned the Turkey. We are having a pork loin cooked on our gas grill rotisserie. We’ve had many Thanksgiving meals we without turkey or ham over the 44 years we have been married. P., happy Thanksgiving to you as well! Pork loin also sounds quite nice. Happy Thanksgiving! One of the many things I am thankful for this year is having the cozy-mystery blog to follow. Thank you for the hard work, Danna. I just pulled an apple pie out of the oven, to go along with the pumpkin pie I made earlier. I will dedicate a slice to you. Michael, happy Thanksgiving, and I hope both pies were satisfying! 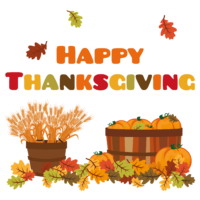 Happy Thanksgiving to Cozy Mystery Staff, may you all enjoy the holiday with friends and family! Thank you for Cozy Mystery, I love receiving them every day — keep up the great job! Ann, Happy Thanksgiving to you as well, and you’re welcome! After surviving a heart attack this month I have many people to be thankful to have in my life as well as having a life. We are going out for dinner so I have settled in watching the Macy’s parade and reading Michael McGarritys newest mystery starring Kevin Kerney. Thank you so much for your blog! I have amassed over 300 mysteries in my Fire alone in the last couple of years thanks to you. Not to mention the paper backs and hard covers. I always have something to read anywhere I go thanks to you and your blog! Rita, while I’m sorry about the heart attack, it sounds like you’ve come through the other end in a good place at least! Happy Thanksgiving! Jill, that definitely sounds nice! A nice relaxed holiday where other people do most of the work sounds very appealing. Happy Thanksgiving! Love your blog and appreciate everyone’s comments that help me find new authors. Since there’s just 3 of us, we dine out at a local restaurant. Folks can pick traditional turkey or something else if they choose. Happy Thanksgiving to all. Ingrid, happy Thanksgiving to you as well! Eating out does sound nice – definitely a more relaxed way to handle a smaller holiday gathering. Carol, it sounds like a good way to spend the holiday gathering! I hope you enjoy your turkey day. Happy Thanksgiving! Amen to the Thanksgiving celebration you described. It sounds wonderful. Blessings to you and yours. Debra, happy Thanksgiving to you too! Happy Thanksgiving to you and your family. I am thankful for your website that keeps my buying and reading in perfect order! Christine, I hope you had a happy Thanksgiving as well! Happy Thanksgiving to you also!!! Sherry, I hope you had a happy Thanksgiving as well! Hope you had a happy Thanksgiving! It was just my husband, son, and me, too, but we enjoyed our time together. Thanks for keeping your readers up-to-date on what’s new in the cozy mystery world! Ruth, you’re welcome, and I hope you had a Happy Thanksgiving as well! I always look forward to your blog. It’s mainly where I find my favorite mystery authors. Got the new #1 Ladies Detective and Aunt Bessie mysteries. Both are excellent. Likewise, the Wedding Planner mystery new book you mentioned. Martha, thank you for the kind words! I’m always glad to hear that people are finding the site useful. Thanks for keeping us all updated on this site! Melissa, you’re welcome, and a belated happy Thanksgiving to you as well!